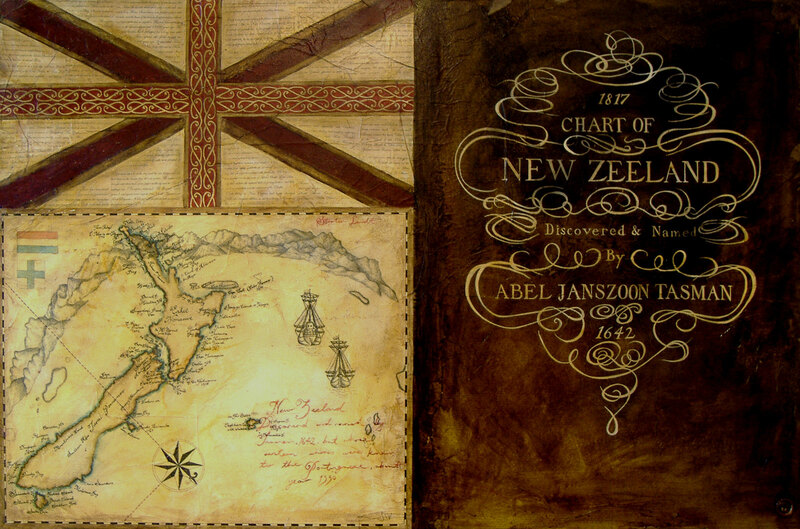 New Zealand was discovered many times by many different people, the earliest accepted discovery being the Polynesian Explorers who traversed the Pacific over many years reaching Easter Island, Hawaii and New Zealand making up the Pacific Triangle. Based on a small portion of another map of the Indian and Pacific Oceans (Artist unknown) 1817. It was obviously taken from Cooks map but with the addition of Cape East: Cabo Fermoso 1550 & Cook Straits: Gulf of the Portuguese 1550. The red script is how the map was titled. Dutch & the original Portuguese blue cross on white. Based on the drawing by an artist aboard Tasmans ship whilst at anchor in ‘Murderers Bay’ . Heemskerck and Zeehaen, 60 & 100 tons carrying a total of 110 Tasman’s men through the Pacific in 1642. The red represents a long standing favourite colour of the Maori. The Patiki/flounder design is a symbol of Hospitality. The Union Jack represents the British Colonization of New Zealand.